Those that know me, or follow along just for all the excitement on Facebook, know I’m a long-time Denver Broncos fan. Yet I’ve been spotted in my newish home town of Seattle, wearing a Seahawks’ shirt and cheering them along as well. Now both teams are headed to Super Bowl XLVIII on Sunday. Who the heck is Jay T. going to root for? Why the Denver Broncos, of course. Of course? But aren’t you sort of a closet Seattle Seahawks fan? Not really closeted, it’s out in the open. The Hawks are my second favorite NFL team. Look, I’ve been a fan of the Broncos since my father was stationed in Denver when I was in the sixth grade. You’re what, 12 years old in sixth grade? That means Ive been a Broncos fan for close to 42 years. That’s a long time to root for a football team. Through the agonizing losses in the first four Super Bowls they played in to back-to-back world championships in SB’s 32 and 33, I’ve stuck with the Broncos for four plus decades. I’m not about to stop rooting for the Broncos now. Good grief, you’re talking about a grown man that wept when John Elway raised the Lombardi Trophy for the first time in Bronco’s history. Openly wept. Don’t get me wrong, it’s been a blast watching not just the Seahawks this season, but the fan base in Seattle as well. This city loves this team, and I can see why. They are young, and play with spirit. They’re fun to watch, and they are pretty damn good. The “12th Man” is strong in this town, and it’s really been cool to live in a city that supports its teams, a quality somewhat lacking in my former abode of Phoenix. I’ll blame all the transplants (and the idiot owners of the Cardinals). Anywho, that’s the deal. I’m a Broncos fan first, and a Seahawks fan second. I want the Broncos to win. But I’ll probably be OK if the Hawks manage to pull it out. At least it won’t feel like it did when the Broncs lost to the Cowboys. That hurt. Of note, my record for predicting Super Bowls is about on par with my record for completing NCAA basketball tournament brackets — pretty miserable. By now, you’ve probably seen the NFC Championship post-game interview between Seahawks cornerback Richard Sherman and Fox’s Erin Andrews. If you missed it, basically Sherman went crazy after a mic was jammed in his face seconds after he made the game-saving play. It’s been all over the news, to the point of absurdity. I’m not going to rehash Sherman’s diatribe. 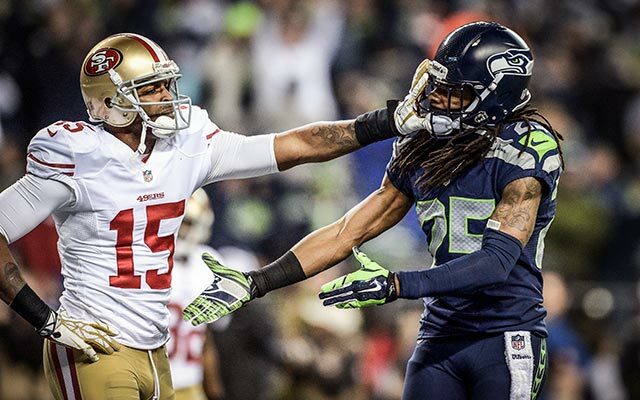 Basically it boils down to this: the Seahawks and 49’ers don’t like each other. Sherman and Crabtree really don’t like each other. Football is a brutal sport. Grown men attempt to rip the heads off other grown men. It’s a violent game. What did you expect Sherman to say in the post-game interview? Sherman feels he’s the best cornerback in the NFL. Sherman had just broken up a play in the end zone that sent his team to its first (oops) second Super Bowl. And he’s being berated in the media? Why? Because he was amped up and said what he felt? He didn’t drop an F-bomb. Despite what many seem to think, his mentioning “LOB” is not a “gang reference” — it’s a reference to the Legion of Boom, the nickname of Seattle’s league-leading defense. He said how he felt. So what if the guy dissed Crabtree? Who cares? This is football folks, not tiddlywinks. Crabtree can take it. And as long as Sherman’s got the goods, he should be able to dish it out however he likes. #GoBroncos. And Hawks, I’ll root for you in every game you play. like you Jay, one of my good friends is an old school Denver fan, and like you has been spotted supporting Seahawks gear, and like you, he will be rooting for his team. friends and i have discussed; if we had to relocate it would be fun to see other teams, in other stadiums, and having fun all the while supporting our team. its just being a fan, whomever a person roots for but in the end, its GoHawks 😀 Have a great game! I think it’s going to be a great game, Toby. #1 offense against the #1 defense… fun times! I expect Sherman to talk like an educated man he is, with professionalism. Respect his opponent and the game and his interviewer. Yup. Super Bowl XL (2005 season, played in 2006) Lost to the Steelers. PS Despite not being a big football fan, I’m taking the Broncos in the Super Bowl for the simple fact that they’re a team more familiar to me than the Seahawks. Secretly however, I would like to see the Seahawks win just so someone will stick a mic in Sherman’s face.